The RCB Library's Archive of the Month for March tells a story that will be of interest to anyone with ancestors from the area between the towns of Carrickmacross and Ballybay in County Monaghan. 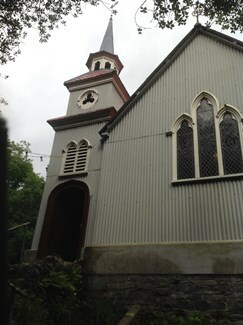 Using extracts from the Church of Ireland Gazette (then called the Irish Ecclesiastical Gazette) and complementary sources, historian Dr Miriam Moffitt has unearthed how the Tin Church of Laragh – a delightful chapel-of-ease in the parish of Crossduff – came to be constructed at the end of the 19th century. The story beings with a fund-raising effort, kickstarted by the Gazette in 1890, in which the then rector of Crossduff outlined a need for a permanent place of worship for local children and other parishioners. Appeals were made in the paper during the spring and summer of that year and, as the months went by, the names of donors and amounts contributed were published. Laragh church operated as a chapel-of-ease to Crossduff parish church for 71 years until its de-consecration in 1962; it subsequently fell into disrepair. A group of local enthusiasts has recently undertaken a sensitive restoration of the building, enabling public access to the building which is used as a venue for concerts and social events. See the RCB Library's Archive of the Month for the full story of the Tin Church.